It’s been a while since I’ve done anything to upgrade my PC. My last upgrade was “out-of-the-box”: a Ducky Shine 3 full-sized mechanical keyboard to replace my flimsy Rapoo wireless keyboard that kept me away from any serious games. This time, I’m addressing a more performance-related aspect of my PC. I consider my PC good enough in all other areas: Intel Core i5-3570K, 2×4 gigs of Corsair Vengeance, a 2-gig MSI HD7850, a 250-gig WD Blue for the system and 3 terabytes of Hitachi for the primary storage. Everything is great for now. Gaming is okay, with enough frames per second to prevent me from damaging my Ducky. But I’m not fond of the idea of shutting it down after a day’s work (well, a day’s play). It takes about 21 seconds for my PC to display the Windows 8.1 login screen from a cold boot. This, I don’t mind. What I do mind is the time it takes from login to ready. Get this: 4 minutes plus. I could fall asleep in half of that! I have enough RAM and definitely enough juice in my i5 to crunch through the startup process easily. The bottleneck is clearly my WD Blue. 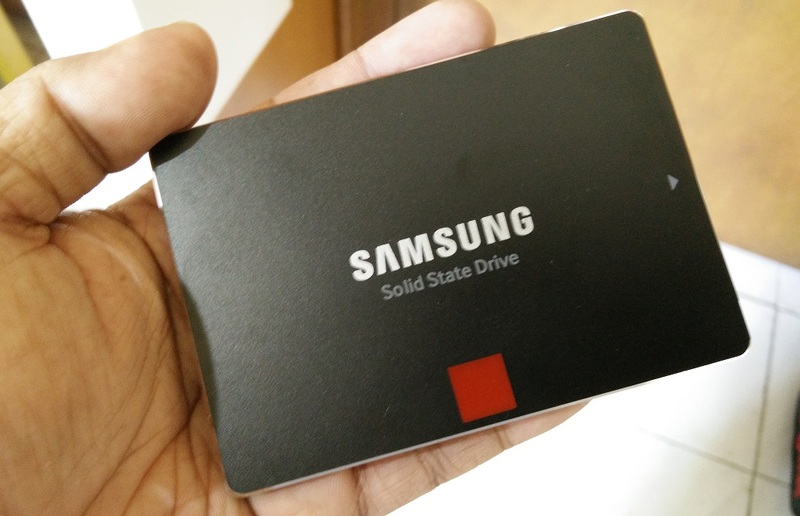 The course of action is clear on this one: ditch the HDD and get an SSD. It has to be (1) big enough so that I can migrate my existing HDD without problems, (2) fast enough so that grumpy is replaced with happy, and (3) doesn’t make me cry when I look at my bank account later on. Five minutes of googling will tell you that in mid-2015, the one of the best all-around performer SSD is the Samsung 850 Pro. I quickly found a unit at a computer store near my home. At about $148 (or IDR 2 million) at the time of writing, it’s also not that expensive considering its performance. I tried to follow the steps outlined here. On second thought, the new drive is actually larger than my old drive. I can skip the backup and the move-here-and-then-move-back-there routine, right? Awesome! Opening up my Corsair K550 to find a spot for the SSD is a walk in the park, and after fumbling with the box my P8Z77-V Pro came with to find an extra SATA cable the installation is straightforward. Turning on the PC, I see that the BIOS detected the SSD and proceeded to log into Windows as usual. I skipped the backup, cloned my WD Blue to the 850 Pro, reconfigured the boot priority, and it’s good to go. These numbers (especially Samsung’s numbers) are not taken on the first successful boot. After I switched to the SSD and/or whenever I plug the SSD into a different SATA III port on my motherboard, the boot time will take forever. Well, no, actually it’s about 5 minutes. I’m assuming Windows 8.1 is doing it’s thing, but you should google it if you really want to know. You can’t go wrong with an SSD upgrade. My total boot time is now improved from 4-5 minutes down to less than 60 seconds. That’s a roughly 5X increase. I bet Adobe Lightroom and everything else on my PC loads that many times faster also. This is by far the easiest and most convenient way for me to squeeze that extra oomph out of my existing hardware. It may be a bit on the pricey side, especially for some people who contact me and say “hey, can you build me a PC for 250 bucks?” (you know who you are). I already spent about $2000 on my PC, so yeah, this is an enthusiast’s upgrade. 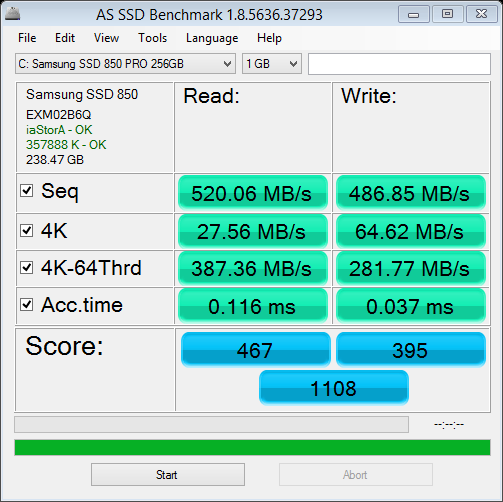 All said, I couldn’t be happier with the decision to join the SSD bandwagon. Also, I’m glad I’ll have an extra 250 gigs of storage to stash my music or whatever. This has been fun, and I’d recommend the 850 Pro for enthusiasts who want the extra bit of performance.